Best known as one of the treasures given to newborn Jesus on the first Christmas, frankincense has been used in religious ceremonies for thousands of years and ancient Egyptians used its fresh, woody, spicy, balsamic properties for precious perfumes and skin soothing salves. Believed to strengthen the immune system, frankincense is naturally calming, and its soothing, cell-regenerative properties are known to soothe inflamed skin and help support healthy cellular function, which may reduce the appearance of skin imperfections. When used in aromatherapy (diluted in water in a diffuser), frankincense encourages feelings of peace, relaxation, satisfaction, and overall wellness, and also has sensual and aphrodisiac properties. 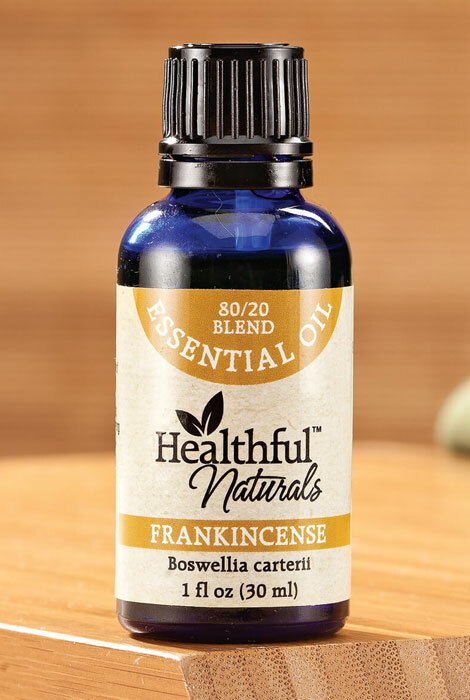 Healthful™ Naturals frankincense essential oil is made from 80% pure jojoba oil and 20% pure frankincense oil, steam distilled from the resin. When applied to bottoms of feet, it helps balance mood and promote a feeling of relaxation. Complete with orifice reducer cap for slow drop delivery, the generous 30 ml (1 oz.) bottle includes approximately 500 drops of aromatherapy oil. Not intended for internal use. Love this scent. Now you need to also carry Myrhe.